Custom 2.5 x 4.125 round corners full color magnets outdoor safe – are usually preferred for marketing by advertisers who wish to position themselves uniquely in a crowded market place. This magnet may not influence people as larger than life billboards do, still it can build right impressions. Branded promotional 2.5 x 4.125 round corners full color magnet outdoor safe can be employed for any kind of short or long term promotions. 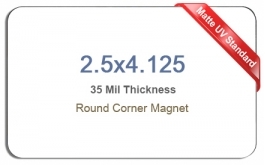 A personalized 2.5 x 4.125 round corners full color magnet outdoor safe can be affixed on company vehicles or advertisers can coax their wellwishers and their customers to affix it over their vehicles. Product Size : 2.5 in. x 4.125 in.